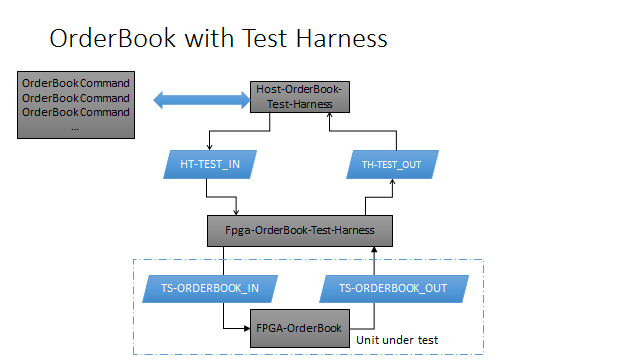 This post will cover the next iteration of implementing an OrderBook inside an FPGA that is based on a NASDAQ ITCH 4.1 market data feed. 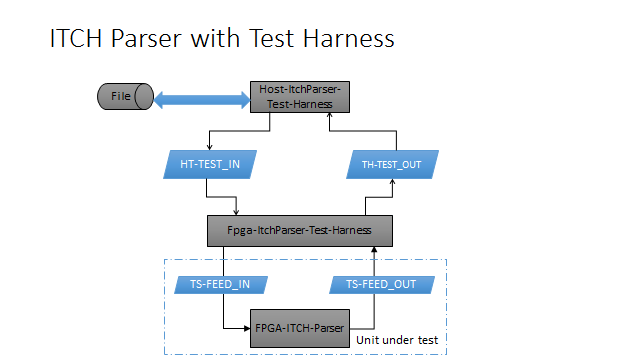 Some time has passed and I have finally found enough time to finish all the code changes required for the two (2) components listed below, along with the requisite test harnesses to validate. 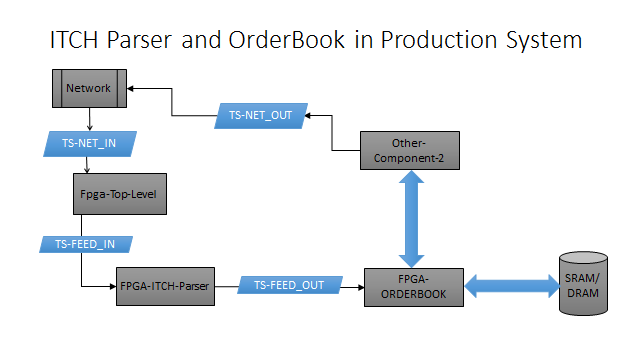 FPGA loop that listens to incoming data from a Network Interface Card that parses, filters and translates each incoming message and sends the appropriate message/command to the OrderBook loop. FPGA loop that reads and writes Orders to memory using an insertion sort algorithm. The Orderbook is currently able to support only one instrument and one side. It’s capacity is 1,000 elements, which through the power of LabVIEW for FPGA can be easily adjusted, but that is not important right now. The OrderBook currently supports two commands: add order and get all orders. The get all orders command is meant to be used by a user or client application for trading and other purposes. What Does a Test Harness Look Like? Well, normally to create an FPGA based anything, one needs to use Verilog, VHDL or one of any numerous “high-level” design languages. Here you can accomplish the same thing, but with a really great programming interface that matches the Verilog programming model, but only with a graphical interface. This means you can create a custom FPGA based solution, reduce your datacenter power usage, increase your applications performance, and reap the rest of the great benefits of FPGA-based computing. 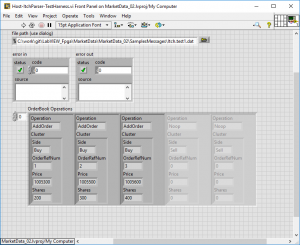 I encourage you to download the source code for this and to see for yourself what LabVIEW for FPGA can do for you and to then try it in one of your own applications. Stay Tuned… What is next? Hook the ITCH Parser up to an actual Network Interface Card, preferably a 10 Gigabit, since I already own the hardware to do so. Hook up either a MicroBlaze processor or the host computer to the OrderBook so that something can be done with the OrderBook data itself. I skimmed over the specification to get an idea of how Market Data works. What I basically understand is that at the start of the trading day, NASDAQ sends a list of all securities that will be available to trade for that day following by a bunch of messages indicating changes to prices being offered to buy or sell for the security as well as actual trades. The basic format of an ITCH 4.1 Market Data message is the size of the message, followed by the data, where the first byte of the data is the message type. So using this information we can easily decode an entire ITCH feed, paying attention only to messages that interest us. So 22,711 is 06:18:31. That is pretty early in the morning, so it looks like this particular NASDAQ ITCH feed starts with pre-market trading. I included the “As Needed” Event Codes, because that is when things will get real bad, and you will probably want your FPGA to get ready to liquidate everything in your portfolio… More on that in the future, but for now we must stayed focused on trading Trump and his tweets. 15 1 20 (space) Financial Status Indicator – Indicates when a firm is not in compliance with NASDAQ continued listing requirements. This sounds like a way to find distressed stocks that are about to be delisted – lots of volatility with low volume. Okay, so we can now decode a couple of message types. But this is not important and is only distracting us from the goal. We can decode all of these messages inside a MicroBlaze Soft Core Processor running embedded C++ inside the FPGA, and then send a message to the rest of the FPGA telling it how to deal with the rest. So let’s keep scanning this Market Data file and find a message that helps us with trading. Okay, so it looks like the Trading Action Message just tells us when trading is officially open…etc. Nothing of use here for the FPGA plan. Anyway, on to the next message type that I find. So I am looking at the NASDAQ ITCH 4.1 specification (as you have obviously realized by now) and I see that the order immediately before “Add Order with MPID Attribution” is “Add Order – No MPID Attribution”, which is exactly the same as the message above, but without the last field. The only other difference is that the message type is ‘A’. So the specification says that you convert all Integer price values and treat them as fixed pointed numbers with the first 6 places representing the integer portion and the remaining 4 representing decimal digits, and this leads to a maximum price of 200,000.0000. 000297ac is equal to 169900, which is 16.9900, or simply $16.99. Okay, so we know when the market opens and trading is started, stopped…etc We know when a new order is added to the NASDAQ order book. What is next? Order Delete! Order Delete is different from Order Cancel. Order Delete means that the entire order is removed or deleted from the Order Book, Order Cancel is whenever a portion of an order is cancelled. Number of shares being removed from order. Hmmm… is someone backing out of a position? Scared!!! that means sell! Eh, maybe not, they only removed 10 shares. But what if they are trading a high-priced stock like Amazon or Google? Oops, I meant Alphabet… and what about Berkshire Hathaway? Okay, so we have Add Order, Remove Order, Shorten Order. What is left? Order Execute and Order Modify. I will go with Order Executed. NASDAQ generated day-unique match number. 14-17 4 00 00 00 64 (decimal: 100) Number of shares executed. I think that I have enough information to get started with the FPGA portion of this. So I will skip analyzing the Order Replace Message for now. So…. So I can go ahead and analyze the rest of the messages, but I want to get to some coding. Coding as in drawing some LabVIEW program (no, not writing, but drawing). 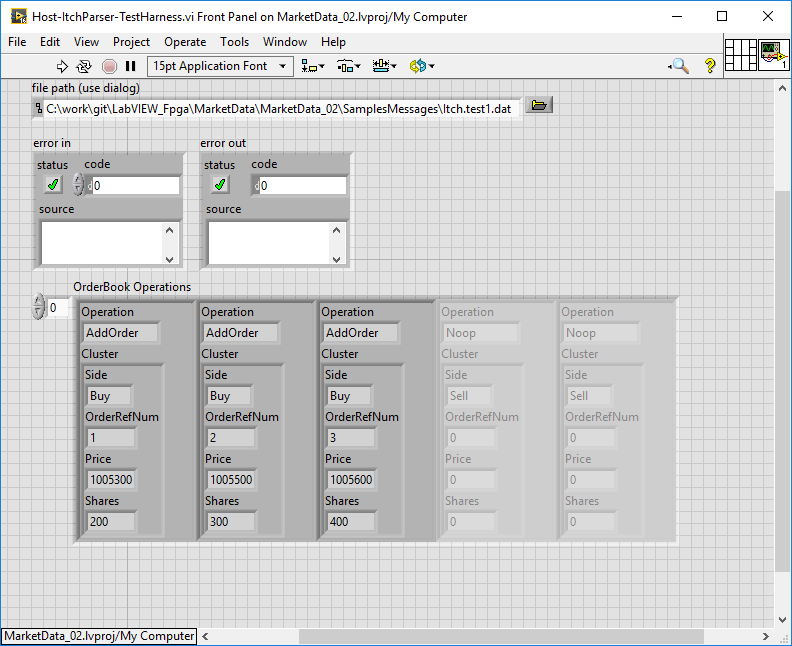 Anyway, I will take a look at how to write (aka draw) some LabVIEW for FPGA code that can handle the parsing and interpreting of the necessary information to react or trade to a Trump Event. Stay tuned. I am sure that every single trader gets nervous whenever Trump speaks. If he says “wall” they have to go short the Mexican Peso, if he talks about Obamacare or the “Unaffordable Care Act”, they have to short Healthcare stocks. During his first news conference on Thursday, January 11th, 2017, he went a step further and said he wants bidding and competition for Government purchases of Pharmaceutical drugs. So not only did the Mexican Peso suffer, but so did Pharmaceutical companies such as GlaxoSmithKline, Merck and Pfizer, among others! His news conference was from 11:00 am to 12:15 pm. Now how do you use your custom trading algorithm to make money during such an event as a Trump News Conference? Simple, use FPGAs! Look at the spike in volume at 11:22, and look at the price difference! So a trader or algorithm looking to exploit this opportunity faces some challenges. Your algorithm is now being bombarded with thousands, if not hundreds of thousands of messages about the price of the security which you want to trade. Your market data feeds are being overloaded and the time it takes to process each message increases. The amount of time that it takes to process a message with respect to the amount of messages coming in is never linear. Your algo is slower at generating messages because your system is overloaded. An FPGA can help in all 3 areas. The advantages of an FPGA, especially when in a Network Card configuration is that all of the above happens inside hardware, and is completely outside of your host computer. So imagine that your host computer gets only Market Data from a list of securities instead of all Market Data from all securities. Your host now no longer needs to filter market data before sending the information to your algo. Now the FPGA can also pre-process the data and send the data in a easier format to the host computer. Imagine your host computer no longer has to perform simple calculations that it uses to determine whether or not trade because that has been done inside the FPGA. And finally, why generate and send orders to buy or sell a security inside the host computer when the FPGA can do that for you as well? Instead of sending an entire order down your operating system stack, just send a bunch of parameters to the FPGA and let it handle creating the appropriate messages, calculating CRCs and checksums, and of putting them on the wire.